Healthcare Mergers and Acquisition (“M&A”) activity continued its half-decade long growth trend in 2017. When excluding the managed care megadeals in 2015, the dollar value of healthcare transactions has continued to increase annually since 2012. Mega-mergers and disruptive transactions dominated the headlines however, the transacted value of small to midsized organizations also increased in 2017 relative to 2016. The increase in both volume and value of healthcare M&A activity is driven by changing technology, an aging population, an increase in the number of insured people through the Patient Protection and Affordable Care Act (“ACA”), and the implementation of value-based payments and alternative payment models. Taken together, these factors have driven providers to consolidate and coordinate in an effort to take advantage of the economies of scale necessary to meet the goals of the “triple aim”, namely, increase service offerings and access to care, decrease cost, and improve the quality of care. An overarching factor shaping the near-term future of healthcare M&A activity is the uncertain regulatory environment. While buyers tend to proceed cautiously in the face of uncertainty, large regulatory changes affecting healthcare providers have historically been accompanied by an increase in M&A activity. Increased capital budgets as a result of the Tax Cut and Jobs Act of 2017 may result in an increase of M&A activity, despite the near-term uncertainty. 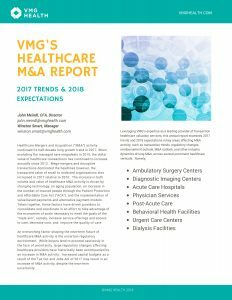 Click here to download VMG Health’s 2019 Healthcare M&A Report. Complete the form below to download the Healthcare M&A Report 2018.